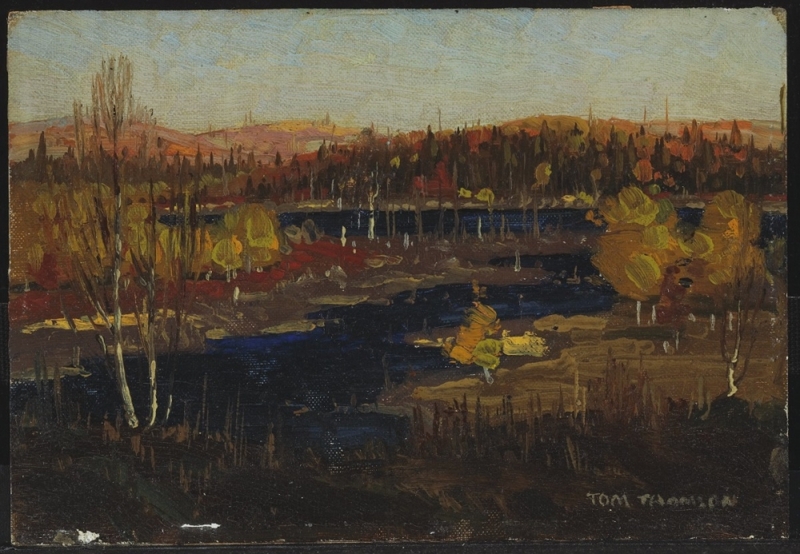 Tom Thomson's landscape paintings in oil created an enduring image of the Ontario North. His art both reflected and reinforced developing Canadian nationalism. 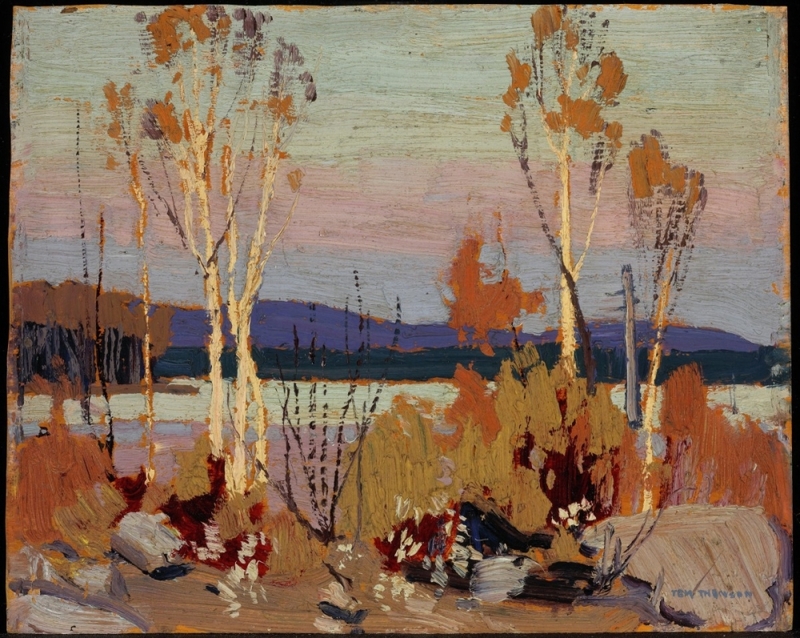 Although he was associated with the Group of Seven, he was not a member. His early death helped make him an iconic figure. Thomson may have attended evening art classes at the Central Ontario School of Art and Design, Toronto, and studied with William Cruikshank in 1905. He acquired the strong design skills evident in his art (Northern River, 1914-1915), in the Toronto commercial art world. Thomson joined Grip Limited, Engravers, in 1909, and Rous and Mann Press Limited in 1912. Thomson met members of the future Group of Seven there, and at the Arts and Letters Club in Toronto. He shared studios with A.Y. Jackson and Franklin Carmichael at the Studio Building. Thomson's work reflects his exposure to Arts and Crafts design, the work of his artist friends, and contemporary Scandinavian art, as seen by Group of Seven members Lawren Harris and J.E.H. MacDonald in a Buffalo exhibition of 1913. After a brief business career in Seattle, Thomson became a Toronto commercial artist in 1905. He began painting in 1911, and (with the support of Dr. James MacCallum) became a full-time artist in 1913. Thomson first visited Algonquin Park in 1911, and worked there as a wilderness guide. He sketched mostly in the spring or summer, wintering in Toronto where he worked his sketches up into larger canvases. By late 1915, Thomson's approach to landscape painting was more imagination-based. He often sought some natural feature corresponding to his pre-existing ideas, or painted landscapes in his Toronto studio from memory. 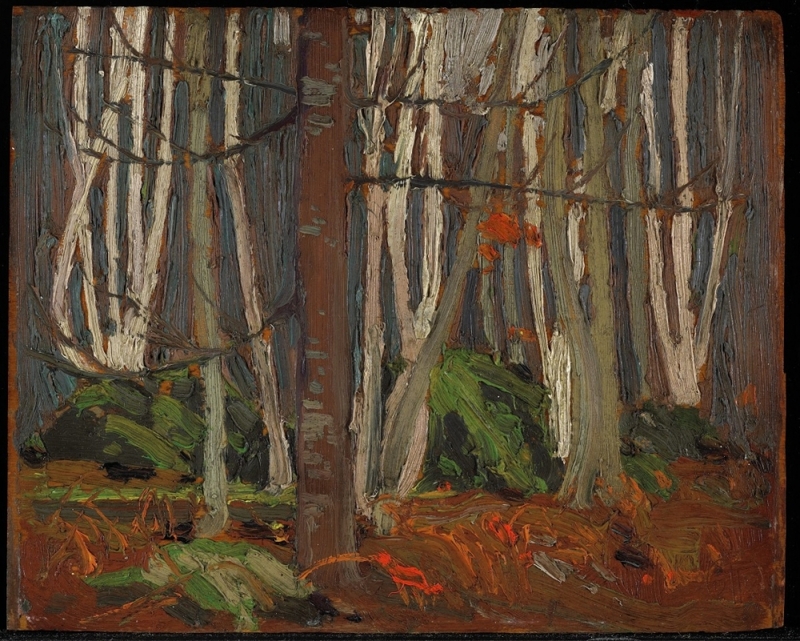 Thomson's design experience permeates his late canvases, which feature stylized tree branches and flat areas of strong colour (The Jack Pine, 1916-1917). The National Gallery of Canada owns many of Thomson's sketches, as well as the larger paintings he made from them (The Opening of the Rivers: Sketch for 'Spring Ice', 1915; Spring Ice, winter 1915-16). Thomson drowned in Canoe Lake in 1917.